This year there is much to consider at Thanksgiving time. We suggest you watch Real America w Jorge Ramos’ recent podcast episode: The Untold Story of Thanksgiving. "This is an American history issue. When Thanksgiving is talked about, many tribal nations prior to the pilgrims is never told. "This #Thanksgivingweek on Real America with Jorge Ramos, we take you to a side of U.S. history that is often untold. The attack on native land rights is the current issue native tribes are facing with Congress that could potentially threatened their livelihood. It highlights a modern issue that has historical underpinnings. The Mashpee Wampanoag Tribe received federal acknowledgment in 2007. In 2015, President Barack Obama’s Department of the Interior placed 321 acres of land into trust for the tribe declaring it the tribe’s sovereign reservation. The U.S. Supreme Court of the United States recently held that in order for the federal government to take land into trust in behalf of a tribe, the tribe had to be under federal jurisdiction at the time of the passage of the Indian Reorganization Act in 1934. After the Mashpee land was taken into trust, some Massachusetts residents who opposed the tribe’s plans for a resort casino filed suit against the tribe, challenging their “Indianness”. In 2016, a federal judge held that the Mashpee did not qualify as “Indian” under the 1934 Act and ordered the Department to reconsider its decision recognizing the reservation. The U.S. Department of the Interior, under the current administration, decided in early September that it would not dispute the judge’s decision and reversed its 2015 determination. Through this decision, the Mashpee’s sovereignty is restricted as is the tribe’s ability to exercise meaningful self-governance. Moreover, its reservation is also threatened with being disestablished. Millions of dollars in funding are being lost or delayed for the tribe’s critical community service programs and emergency services. Some suggest that the Department of the Interior’s decision marks the return of the Termination Era. Indian law experts have suggested a decision against the tribe would represent the first time in decades a tribe had lost lands after they had been placed into trust by the U.S. government. Since the September decision, the Mashpee community has been building awareness and support. Earlier this year, Massachusetts Congressmen Bill Keating and Joe Kennedy proposed legislation, H.R. 5244/S. 2628, The Mashpee Reservation Reaffirmation Act, to protect the tribe’s reservation, preventing further legal challenges. 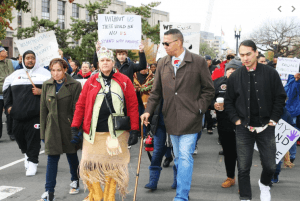 On Wednesday, November 14, the Mashpee organized a protest march and rally in Washington, D.C., to gather support for it. After the event, the tribe encouraged people to call their representatives in Congress and urge them to support the Act.